At 60East Technologies, we think about delivery a lot! We’re always thinking about what can be learned by studying real-world delivery technologies used elsewhere. Perhaps the grand-daddy of all delivery companies is Santa Claus. He’s delivering packages to approximately 526 million children in 150 million households over a 31 hour period. That’s very impressive! Yes; Everyone gets what they want. We hope this comparison doesn’t get us on the Naughty List! We really do think Santa is doing an amazing job – magic and all! In early 2015 (just a couple of weeks away) we’ll be launching AMPS v4.0, which includes features for traveling through time – this is something not even Santa can do. Please join our newsletter and follow us on LinkedIn or Facebook to stay up to date on all of the cool things coming from our lab. And, who knows? 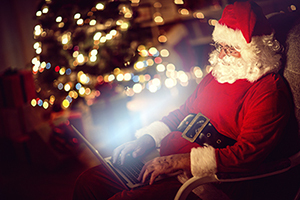 We just might have a little more information about Santa on the way, too. [ii] Ok; We don’t really know, but we have customers with production instances with uptimes of more than 1 year, and AMPS is working everyday not just a 31 hour period once per year! [iii] Arguably, as long as you have the power to achieve your goals, you should be seeking to minimize the horsepower required for delivery. [iv] Assuming Santa uses large Finnish Forest Reindeer, Rudolf, and magic acorns. [vi] 526 million children in Santa’s coverage zone, avg 3.5 children per household, 31 hours to complete delivery (thanks to timezones! ), and assuming no naughty children. [vii] You can push AMPS harder, but we’re going easy on Santa and quoting numbers from our Shock Absorber pattern. [viii] Assuming Santa travels at 904 miles per second, .56 miles median distance between households, infinite acceleration, and includes the time it takes to travel through chimney, eat cookies, stuff stockings, and do other things most people need to do in a 31 hour period. [x] We’ve had many customers that have said AMPS flies. Compared to other messaging systems, it certainly appears AMPS is endowed with some magical powers. [xi] You don’t know what’s in Santa’s bag until after delivery. With AMPS, you always get delivered what you want! [xii] NORAD tries really hard at keeping track of Santa, but there’s no history of where he’s been. With AMPS, you can track the full history of what’s happening in your systems!